In the dark of early morning, we are sitting in the middle of a great summer steelhead river, flashlight on to ward off fellow anglers and chatting with my guide. I could only think how fortunate I was to be on this historic river. This all started about 3 years ago when Tom Malech from the San Jose Fly shop gave a presentation at one of our club meetings on Fly Fishing For Steelhead. He also displayed a couple of books that I promptly bought. I have been fly fishing for Steelhead on the San Lorenzo river for a few years, but while the regs get tighter and tighter, the mass of anglers are getting denser and denser since everyone is trying to hit a day when the water clears up on a Saturday, Sunday or a holiday. You have about as much luck catching a steelhead on that river with a fly as hitting the California lotto. As I read through Trey Combs's "Steelhead Fly Fishing" Book, I was captivated by all the history of the North Umpqua River. I knew then, I had to fish this river. Last year I could not go, and this year was iffy at best, but it turned out that as time wore on deep down inside I knew it was go or bust this year. I left on a Friday afternoon from San Jose with my car semi-full of gear and my head full of fly fishing dreams. As usual, no matter what time you try and leave the Bay Area these days your car gets lassoed and you feel like you're in permanent limbo. It took more time from San Jose to Vacaville than from Vacaville to Redding, but finally arrived at the Dogwood Motel off of Highway 13, about 30 miles east of Roseburg, Oregon. This is a nice clean place with a hospitable owner named Norman Call. Short of camping, they have the most reasonable prices in the area. More specifics are listed at the bottom of this report. I arrived at around 11:30 PM, woke up the owner, got my key, stowed my gear and hit the hay. And as you can probably relate, I didn't sleep well that night, and 4:30 am rolled around pretty quick! I made some coffee and off I went to meet my guide about 15 miles up the road at the famous Steamboat Inn. No folks, I know what you're thinking, there are no steamboats on this river nor have there ever been. The word "steamboat" used in this context means that gold claims, once sold on this river, didn't pan out. My guide was Scott Howell. I had done some reading about Scott and he has had quite an extensive career. He's guided in Alaska and Russia as well as his native North Umpqua River, Yes, Scott grew up on the North Umpqua. His website features a daily fishing report and a ton of other information about the area. A link is provided at the end of this article. I followed him down the road, parked, threw on my waders, and before I knew it we were crossing the Station water. Here it is 5:00 am, pitch black, and I'm wading waist high through a stream. Don't attempt this river without cleated soles! About mid-point we climb up some rocks and sat; Scott turned on a flash light to warn approaching anglers of our claim. At first light we moved into position. This was my first attempt at spey casting on the recommendation from my guide. After trying it for a while I see why. There is so much more fishable water one can hit with a spey rod. We were dry fly fishing with one of Scott's creations. He calls it a Steelhead popper and by golly that's what it is. It needs to be fished a certain way in order for it to hop across the water. As my cast shoots the line into the run, the popping fly stirs a fish and I have a grab. But, as the line straightens out, the fish decides he doesn't like it and my reactions are too slow. He's gone! 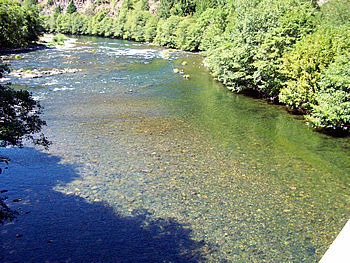 As you will read about the North Umpqua, it is "The Graduate river of Steelhead fly fishing." If you get one chance a day to strike a fish you're doing well. If you're lucky enough to catch one you're doing great. You may see fish roll, jump and even skip, but that doesn't mean you are good enough to catch it. These fish are not hungry; they strike from instincts formed when they were first hatched on the river. After that they grow up some, go out to sea and come back they will not eat again until they return to sea, after they spawn. We fished many famous places up and down this river, the Kitchen pool, Mott pool and the rest of the camp water down to spots not written about but maybe more viable. We had fish rise to our fly, but no takers. I got a lot of spey casting in and was able to eventually shoot about 100 feet of line out without a back cast. I was learning and there were times when my casts were not all that hot. When it comes to fly fishing on a river I can see why there are so many spey rod converts – I'm for one sold. We ended the day at dark and Scott was ready for the next day's plan. We would meet at the Steamboat Inn again for another try at the Station where I almost had a fish on. Sitting there in the morning dark again we talked about fly fishing, anticipating the casts at first light. We saw a few fish roll this morning but no takers. We went on to fish some more of the camp water and further down but the fish weren't taking. They were there we saw them, just not biting. At 10:00 am we were through and I was off. 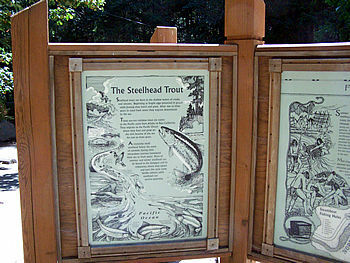 Scott had told me about a place up Steamboat creek where a stream keeper lived part of the year to watch the fish. I envisioned and old guy with a double barreled shot gun sitting in an old rocker but come to find out it was an interesting place. 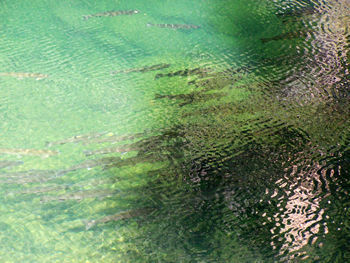 It turns out that a majority of these steelhead migrate up Steamboat creek to spawn. There is no angling allowed up Steamboat creek. The stream keeper is actually a biologist that sits under a homemade canopy and watches hundreds of steelhead all day long. He lives in an Airstream trailer by the side of the creek and anyone is welcome to observe the fish. He say's that the water is 13 degrees cooler coming out of a spring and that is why they congregate there. 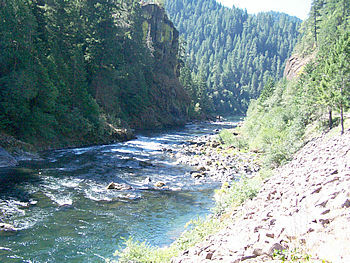 The name of the place is Big Bend Creek other wise known as Dynamite Hole. He also says that before he got here eight years ago, there was some poaching going on. Overall I had a great time. The country and people are very friendly and hospitable. The gas prices are the same, but they fill it up for you – State law! If you're after large summer steelhead this is the place to hunt for them. There are 34 miles of fly fishing only water and in the summer no weighted flies are allowed in this section of the river. All the water is accessible and the scenery, well you'll just have to look at my pictures and judge for yourself.